Time is a luxury we can rarely afford. When we do have such a luxury, doesn’t it make sense to make the most of it? The current undertaking for this column is to go through the five projected Commander 2016 decks and predict exactly what we expect to be printed in them so we can be ahead of those reprintings and also maybe pick out some cards we don’t expect to be printed that pair well with those cards that could have some upside. If we expect a lot of tokens in a deck, for example, we can reasonably expect Parallel Lives to be in the deck and maybe that will affect our buying behavior and depending on the degree of confidence in that reprinting we’ll think about selling. But in the same breath, we look at a card like Eldrazi Monument which was just reprinted and is very unlikely to be reprinted again but which will have some upside with tokens. We might want to sell Awakening Zone and buy From Beyond. However, while it’s easy to guess the big rares that could get reprinted, it might be healthy to look at everything that goes into a deck to see what all we have to be ready for. Being able to predict a staple uncommon reprint or new art on a common may be just as instructive. For example, do you know how many rares and uncommons are in a Commander 2016 deck? Because I don’t! I’m serious – I am 250 words into the article where I’m going to discuss it and my plan is to look it up as I’m writing about it. You’re going to read the article once it’s finished and edited so you won’t know how foolhardily it was written and I’ll probably look by the end but I had a plan, but I want to let you all peek under the curtain and tell you, NOPE, I have no idea what’s actually in these decks. You probably don’t know, either, do you? Who cares? Value is in them. Staples. New goodies. You tear the deck open, you take out the chase rares and stuff you want to play with and put all the other chaff in a pile. The worse the deck is, the bigger the chaff pile is. I have busted open the Prossh deck a bunch and I have a pile of Hua Tuo, Honored Physician big enough to choke a baby to death. I mean, three copies could probably do that, though, so that’s pretty lame hyperbole. And my baby is at the stage where she tries to put everything in her mouth so if she comes across my stack of them, she’s probably going to do her level best to choke on them. Do you understand how dangerous precon deck chaff is? It’s a baby choking hazard and that’s about it. In order to properly guage how dangerous one of these decks is to a new father like me, I’m going to have to actually look at what goes into one of these decks. That looks pretty intimidating, so let’s look at just the rares first. This card is poised for a price jump and I think we have Nekusar to blame. See that buylist price? That’s about to mess stuff up in a big way. Looking forward to it. OK, so we have 100 cards and of those 100, 28 are rare and 5 are mythic. That’s a lot of rares to try and get to add up to a reasonable number. Even though they expect prices to fall, they don’t want the cards in the deck to be like $100 or there will be a run on that particular deck. They have to try and balance things so they get a price aroundish MSRP for the deck, although Commander 2015 decks are all between $50 and $60 total, owing to some solid $10ish new cards like Command Beacon and Blade of Selves. I’d say Commander 2015 did exactly what they wanted, and since they did it 5/5 times, I’d predict they can expect the same level of success for Commander 2016. That means if we look at a hypothetical UW fliers deck and assume they print a $10ish new card like Blade of Selves and a $5ish one like Magus of the Wheel (And not Fiery Confluence like a lot of people expected) we’re looking at about $30ish +/- $5ish (I feel like I’m one ish away from looking like I have no idea what I’m talking about) in value, predicated on cards losing some value from the reprinting. While we’re looking at prices, what did the reprintings do to the values of some key cards in this deck? 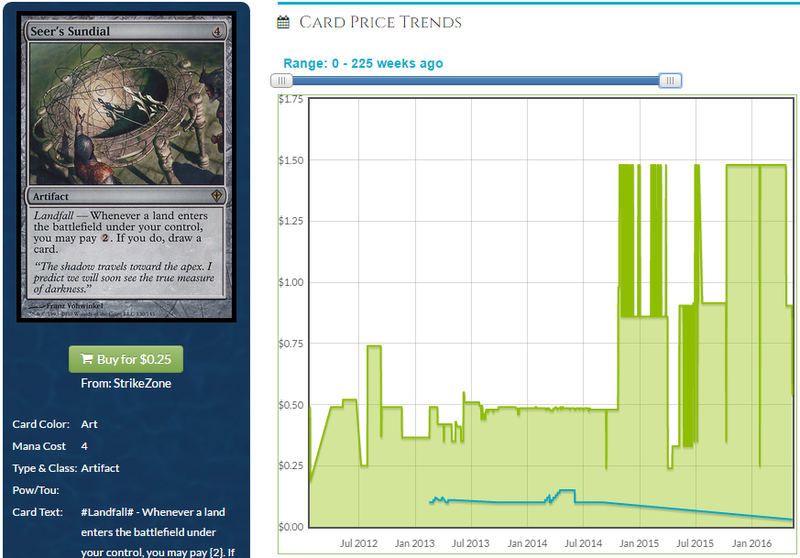 Cards whose prices were stable after multiple reprintings mostly shrugged off the effect of the Commander 2015 printing. Sun Titan only fell off about $1 and some places haven’t even bothered to update their inventory to reflect the lower price on older versions because they’ll eventually sell. We saw this with multiple cards with multiple printings. Cards that have been printed a lot, and not always in Commander sealed product, shrug off reprints a little better and their prices are a little easier to predict. However, the reprintings may have been too much for cards under $2 that may have seen this mass printing as the straw that broke the camel’s back. Relative adoption is obviously a factor – way more people play Lightning Greaves in EDH than play Seer’s Sundial, but that discrepency contributes as much to the higher place in the first place as it does the increased supply being too much for the demand to soak up. 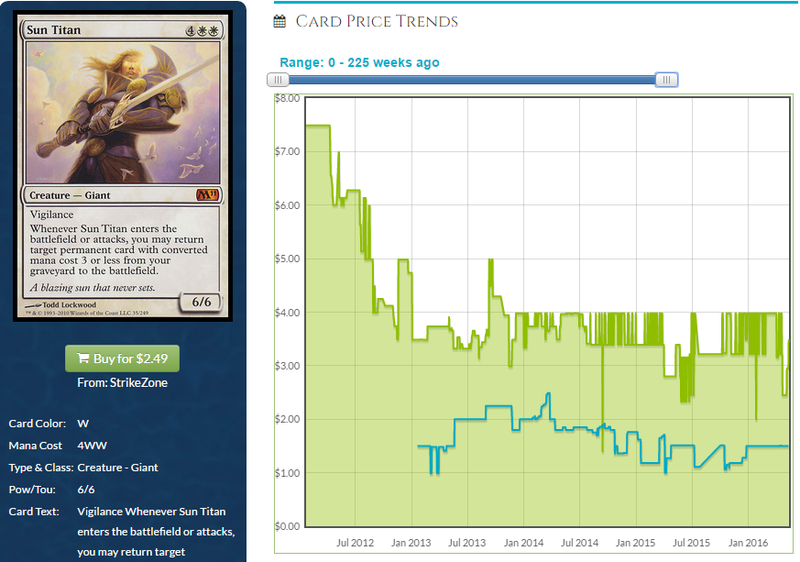 I think figuring out “tiers” of cards is fine since these factors seem to account for each other. There aren’t too many EDH cards with multiple reprintings that are over $10, so we can expect a few things provided they don’t decide to print one of those cards. If they do, we should be able to predict that based on seeing a few cards from the decks or even doing our “What does the wiki say these colors do?” analysis like we did with Azorius last week. For now, I’m going to talk about a few general things to expect. $15ish cards with a single printing that aren’t mythic are getting cut in half. This didn’t happen with Wurmcoil in Commander 2014 but we saw it across the board in Commander 2015. There are a ton of examples – Black Market, Gisela, Eldrazi Monument – the only deck without a good example is the Izzet one and that has practically only one valuable card anyway and it’s new. $5ish – $10ish cards with multiple printings are that price for a reason. The new supply didn’t pants the price completely because people just used the copies in decks right away rather than flooding the market. There are a lot of examples of this, as well. Lightning Graves, Phyrexian Arena, Solemn Simulacrum, Eternal Witness. 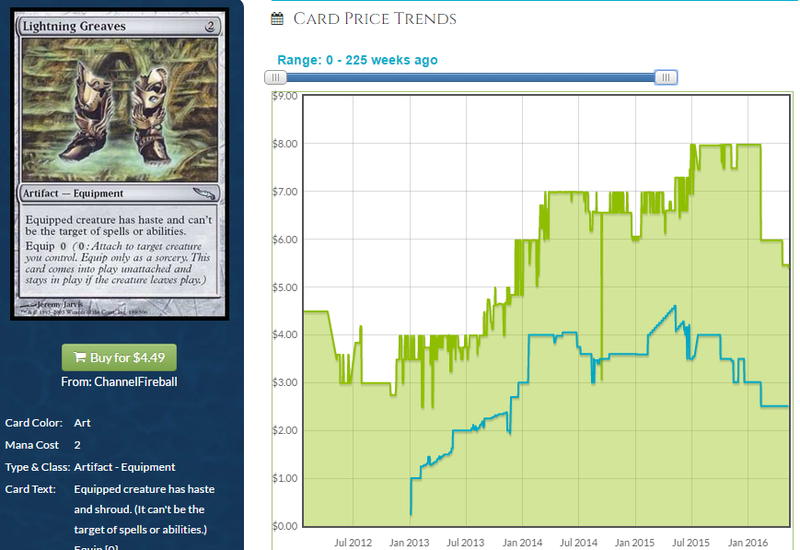 If an uncommon is worth more than most of the rares in the deck, don’t expect the reprinting to pull the price down much. Anything that starts under $3 or so is most likely going to end up around $1. A few exceptions to this were the Titans but those, despite their many printings, were printed at mythic and are very popular cards. 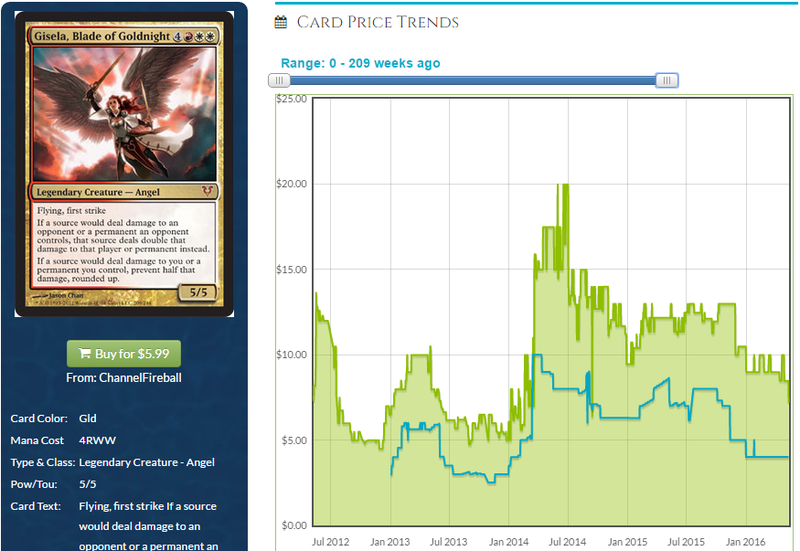 Most cards in the lower tier, even at the top end, took hits, even really solid cards like Prime Speaker Zegana. Expect most of the rares and even mythics to end up here even if they don’t start out there. New printings of popular commanders can hold a lot more value than people thought. $4.50 for Karlov and $7.50 for Meren probably surprises a lot of people. Maybe it shouldn’t. While a good commander printed in a set like Shadows over Innistrad isn’t expected to do much in non-foil, the only way to get Meren is to buy the precon for $40 or deal with someone who did. Also, not being available in foil at all means the precon version is the “best” version unless a judge foil comes later. 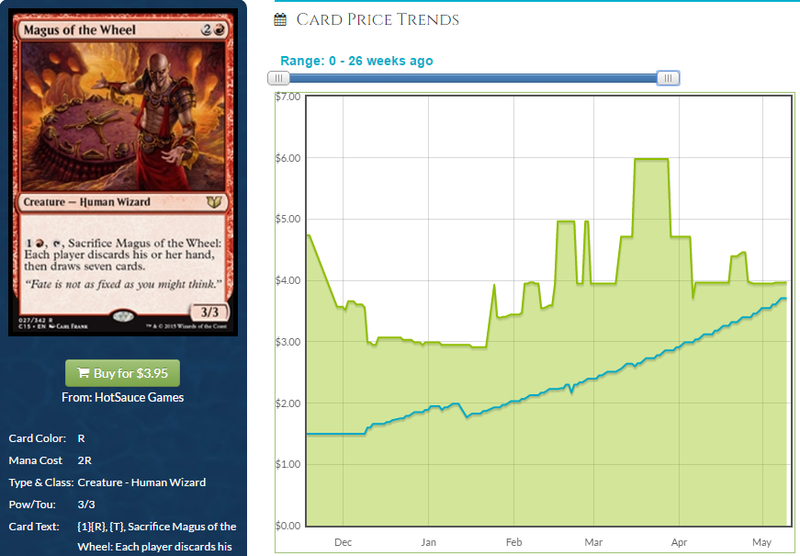 Wizards seems to have dialed in how to make cards for these decks that end up between $7.50 and $10. They don’t make a ton of bulk rares out of the brand new cards they print and every deck seems to have at least one new card that is in this range. 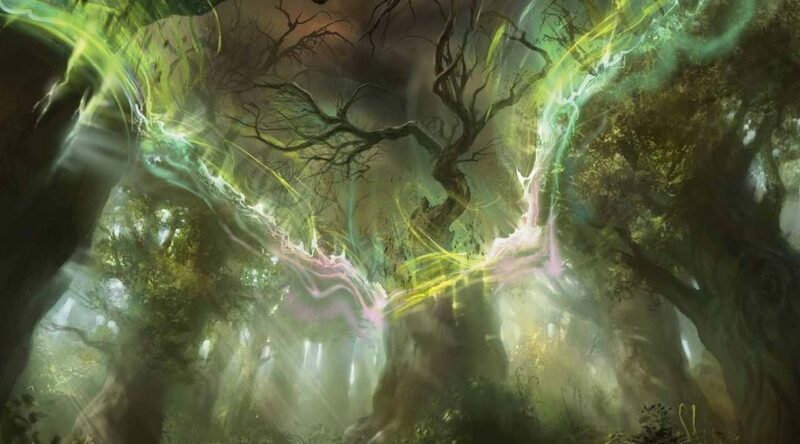 There are 2 in the Golgari deck, but that is not that big a deal. They aren’t making True-Name Nemesis anymore and that’s a very good thing for players. The decks are very balanced price-wise this time around and that’s going to be good for players because they can buy the deck that fits their play style without worrying about speculators buying every copy of the deck like we did with Mind Seize. Everyone is a speculator when the value is that obvious. Barring that this next time around, if we do get some sort of fliers deck, can we try and guess specific cards based on three tiers of prices rather than just the one tier like we tried to do a year ago (trying to find that set’s “Wurmcoil Engine”)? The amount of times they’ve reprinted cards like Solemn Simulacrum makes me think that cards we considered unreprintable before may not be the sacred cows we once thought. If we do get a fliers theme and a flicker subtheme like I’m not even super convinced we will (although birds sounds a bit boring) I think we can take a whack at some of the cards. You get the idea. Most of those cards mesh well with whatever strategy ends up being employed and they won’t upset too many things in terms of prices. It’s interesting to try and pick out how you would construct an entire deck worth of rares and saucy uncommons (I gave up and didn’t do all 28 rares, but I put the important ones) rather than just try and guess one big mythic or rare. This way we can look at cards less likely to get reprinted and evaluate their upside. Eldrazi Displacer is pretty new to be in a flicker deck and Great Whale is on the Reserved List but those could both have some upside, for example. Predicting they might put Deadeye Navigator (I don’t think they would because people complain about it too much) is cool, but predicting Eldrazi Displacer has upside if they do is cooler. Next week I’ll take everything we came up with today into account when I look at the next color combination on the wiki. Until then! I have about 60 copies of Magus of the Wheel in my spec binder, I picked most of them up for around 2.12 each. I know the buy list has been going up steadily, but rubiomagic on ebay still has 90+ copies at 2.99 each shipped. I have noticed lately rubiomagic only sells 4 of 5 copies each week. I expect a price correction but it could take awhile. Selesnya… I feel like Wizards would WANT to reprint Aura Shards but I’m skeptical that they do… Most players on the other side of the board hate that card and feel like it is “unfair” that a bunch of my tokens can wipe out their broken-as-hell artifact ramp and pillow forts before they get a chance to go off on me. Obviously I think its pretty fair… Since Selesnya chooses tokens/creatures over artifacts and pillow-fort enchantments most of the time. 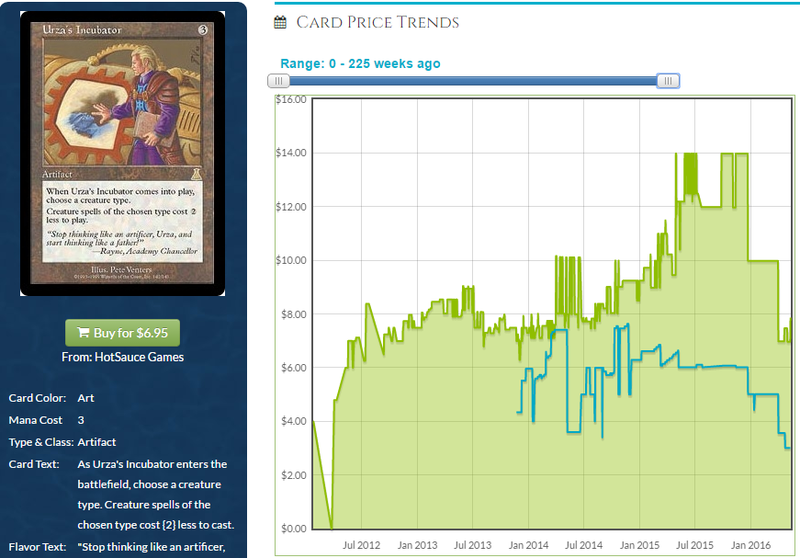 I feel like Wizards has a choice of either reprinting Mirari’s Wake or Aura Shards, but not both in the same deck. How likely do you think it would be that Aura Shards gets passed over due to silly players that like to have 5 artifacts and 3 enchantments on the board by turn 5 crying every time I cast Aura Shards then spit out some tokens? How much does “player politics” and the “feel bads” affect reprint prices? As a Selesnya player I think Aura Shards is fair as hell and should be reprinted (Tokens NEED upside to be good!) But after talking to some other people that don’t play Selesnya… I feel like this card might get passed over for something less hated and “safe”… like Mirari’s Wake or Eladamri’s Call. And they can’t reprint ALL of them (right? )… so what would be your “most likely” pick out of the 3? TL;DR: There can be only ONE (selesnya staple reprint): (1) Aura Shards (2) Mirari’s Wake (3) Eladamri’s Call… Which one gets reprinted and why/why not? Aura Shards was already in a Commander Precon, so I feel like it’s an OK reprint. Wake is fine – Call doesn’t feel like it’s something they’d do. I don’t have data, just a feeling. I don’t feel like Eladamri’s Call fits what they try to do with these decks. being reprinted instead birds. But then again UG Simic had a snake theme. Replenish is on the Reserved List. I considered then ruled out enchantments just because they just did that literally last set with Daxos, but nothing would surprise me.